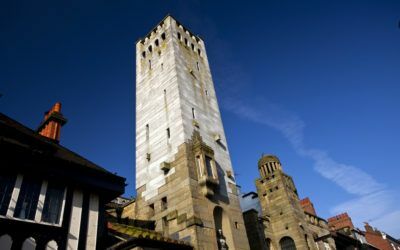 The Belle Epoque and Gaskell Memorial Tower is one of Knutsford’s most iconic buildings. Formerly known as King’s Coffee House, it was designed by Richard Harding Watt. The tower is his tribute to Mrs Gaskell. This Grade II* building was opened in 1907. As originally built, it had the triple function of being council offices, coffee house and memorial to the novelist Elizabeth Gaskell. Richard Harding Watt wanted to commemorate Mrs Gaskell who based some of her works – in particular, Cranford – on the town. Gaskell Tower incorporates two depictions of her and inscriptions of the titles of her novels. Harding Watt (1842-1914) was a philanthropist with a passion for buildings. He made his fortune from glove making in Manchester. He is responsible for the town’s many eclectic Italianate buildings and this building is one of his best-known examples, built with assistance from architect W Longworth. It was opened on 23 March 1907 in the presence of one of Mrs Gaskell’s grandsons. The building is owned by Knutsford Town Council and is used as a wedding venue and restaurant. 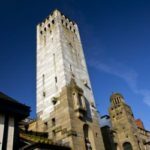 Features include two pillars derived from the original St Peter’s Church in Manchester and the Art Nouveau character remains, with the fireplaces, Venetian glass handmade floors and the Mediterranean Roof Garden. The Belle Epoque has been under the stewardship of the Mooney family for more than four decades and ‘Miss Matty’s Tea, Tour and Talk’ will be given by Nerys Mooney herself, who will share her personal knowledge of the history of the building and its its role in Knutsford life for more than a century.